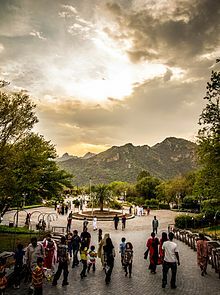 Daman-e-Koh is a viewing point and hill top garden north of Islamabad and located in the middle of the Margalla Hills. Its name is a conjunction of two Persian words, which together means foot hills. It is about 2400ft from sea level and almost 500ft from the city of Islamabad. It is a popular destination for the residents as well as the visitors to the capital.